ASK was founded in 1989. We are a team of five employees and three subcontractors. Our services range from IBM Mainframe Systems through to the most up to date technologies in information processing. In 1994 we won a maintenance contract for IBM’s “Interactive Financial System” (IFS) which gave us responsibility not only to service the product but also all IFS-Customers worldwide. IBM withdrew the product from the market in 2001. Since then, we have continued to service IFS-Customers. We specialise in the development and supply of extremely flexible and individual application systems. As a partner we offer our customers services which are not necessarily part of their core competence. That is why we believe that we can offer these services more efficiently and more economically than our customers themselves can. 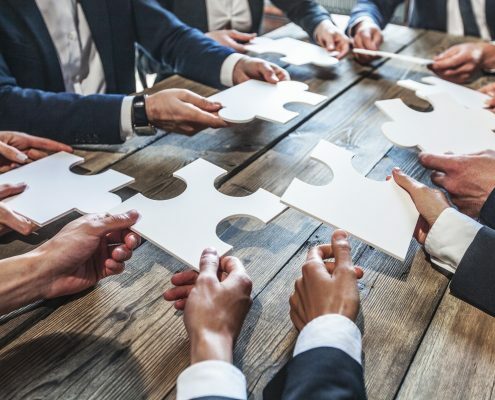 In future the success of an enterprise will depend more than ever before on the sustainability and flexibility with which global communication can be implemented in the operational level within the organisation. There are numerous attempts to curtail the present deficits short term in this area by applying interfaces. This is, however not a long term solution. 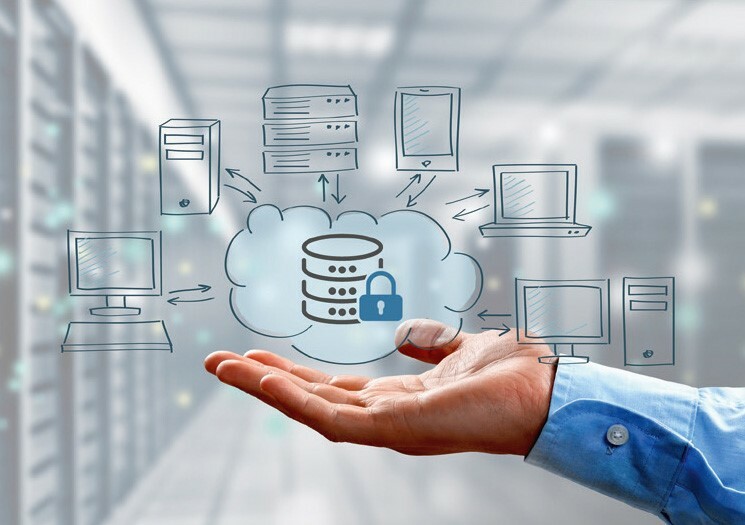 A sustainable reduction of cost and increase in flexibility of the application system can only be achieved by consequent deployment of the new, open technologies. The development of AS-Lingo has benefitted through the concentrated experience of projects from many years at IBM in systems engineering and in customer support as well as from development experience during the years in ASK. The AS-Lingo Framework is a platform that enables us to perform efficiently and economically in development and migration (Legacy systems to J2EE) projects. heterogeneous and globally oriented IT-Environment. This platform enables us to develop applications fast, reliably and efficiently. The functions and processes in this framework are structured components that already include the customary parts of an ERP-System. No part of the framework is proprietary – it is 100% Java! The IDE, the application server or the database server can be freely chosen by the user. The large number of classes that are available in this model today enables us to achieve a high level of re-usability. this protocol is mostly open. AS-Lingo itself has extensive, role based authentication and authorisation features, allowing sophisticated security measures to be defined. The application is started via Java WebStartTM , which is part of the JavaTM-Technology (SUNTM). Java WebStartTM will automatically update the client if a new version of the client is found on the server. All clients are therefore automatically kept at the latest level without manual installation effort. ASK also offers a release independent maintenance of AS-Lingo. Global collaboration between business partners has effected the way we communicate world wide. 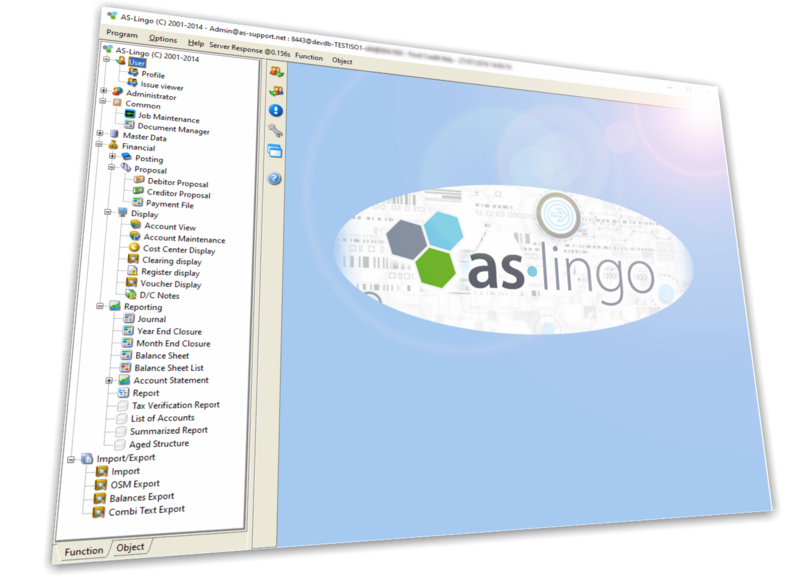 AS-Lingo’s user interface is a smart client which includes all graphical front end panels and the appropriate input check routines. The client can be used on the local network as well as the Internet. High reliability and short response times are the prime attributes of the AS-Lingo . A large number of concurrent users can be run on the System. The AS-Lingo Framework is a scalable system. A single user environment is equally viable as a Mainframe or a clustered server farm with thousands of users. 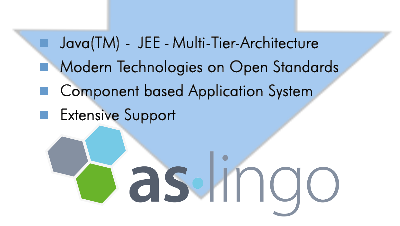 The AS-Lingo-Framework was developed on the basis of a 3-Tier architecture – a state of the art design that has become the standard for most applications that need to perform in a global world of communication. Our customers decide on the purchase of hardware, operating system or database on the virtue of value for money. The application system need not influence or even dictate the choice. The Java© platform is processor independent. It supports all prevalent operating systems (32 Bit or 64 Bit) such as Windows®, Unix®, Linux®, Solaris®, MacOS® or OS/2®. Processors with 32bit/64bit Cisc & Risc-Architectures are also supported. Java© compilation produces a very fast run time code (Bytecode) which is created by a JIT (Just-in-time) native compiler at run time. Thus Java Programs can run on different platforms without adjustments or re-compilation. Independent tests have shown, that Java© has reached run time speeds comparable to C/C++. AS-Lingo Application Framework contains no proprietary components – it is 100% Java©. The IDE, the application server and the database server can be freely chosen. AS-Lingo is developed in JAVATM , an object oriented programming language that allows very efficient development and a high and increasing degree of re-usability. Meanwhile JAVATM has become an industry standard, supported by most well-known companies like IBM, ORACLE, BEA, HP, etc. Skills in this technology has therefore become widely accessible. The AS-Lingo-Framework is an architecture that has grown to deliver an increasing number of re-usable components in the server as well as the client area. Multiple languages and multiple currencies are also part of the system. This is a framework on which new components are developed and integrated quickly and efficiently. before they are finally migrated themselves, thanks to a large number of tools available to bridge the gap. Customer Relationship Management (CRM), Supplier Relationship Management (SRM) and Material Management are also included to a large extent. AS-Lingo has been around in the cloud for over 25 years — even before “CLOUD” became a hype. AS-Lingo was never in a “public cloud”. Always only ever in a secure data center in Germany. Our experts will always support you directly. All defect support is free of charge, as part of our service for you. Get the information you need when you need it. Evaluate risk and monitor your performance in real time with AS-Lingo’s incredibly powerful Reporting- and BI-System. 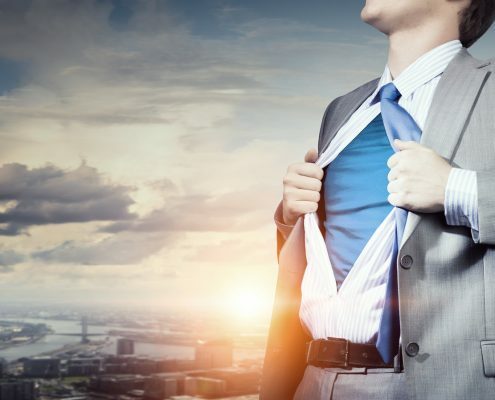 Put yourself in the position to analyse critical business situations anytime and anywhere. Informed and well founded strategic decisions depend on the reliability of the underpinned data. Already today, Business Intelligence and prognostic analysis are part of the ambitious reporting system in AS-Lingo. And even this can be extended by the access of “Big Data”. Tables and data can be inserted directly into Microsoft® Word. Reports and analyses can be automatically crated in Microsoft® Excel. „Lease of experts“ from IBM to help overcome project-bottlenecks. IBM is prime contractor, provides development service and holds project responsibility; ASK is sub-contractor and provides development service. ASK is prime contractor, provides development service and holds project responsibility; IBM is sub-contractor and provides development service. IBM is prime contractor, provides no development service and holds project responsibility; ASK is sub-contractor and provides development service. The extent of project responsibility take on by IBM varies in each of the above constellations. I.C.M.E. Management Consultants In this case joint projects are also possible if a customer wishes to spread the project risk onto “broad shoulders”. Sun Microsystems ASK is iForce Partner as Partner-Status. Hewlett-Packard AS-Lingo is certified to run on HP-Systems.